We can look harder at local manufacturing for job creation and also reduce transportation cost and pollution. 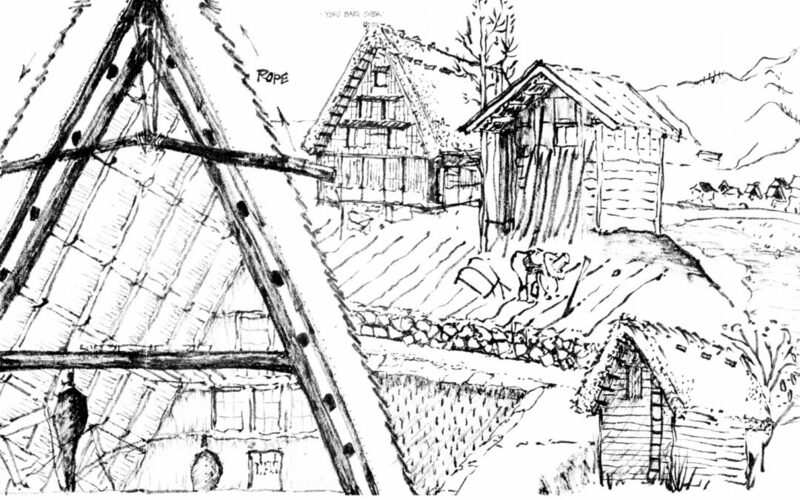 This is an example of the interior cross section of a silkworm farm, with the exterior in the background. Local manufacturing has historically been micro versus macro before the factories of the Industrial Revolution and the mega industrial complexes such as the Detroit auto hub. In this case, silk production for fabric was small and local instead of at large textile mills that exist around the world. Local jobs simply support the local economy. With the advent of the information age, small may come back into favor over large because small business owners can connect to resources and supply chains via the Internet cloud. Author and illustrator: Charlie Szoradi is an architect, inventor, and the CEO of Independence LED Lighting. He writes about many other topics related to local manufacturing through his extensive travels around the world. If you have found this posting online, it is an excerpt from Mr. Szoradi’s book Learn from Looking that served as the inspiring seed content for this drawing share resource. For additional drawings and insights on job creation through product production, we hope that you enjoy exploring LearnfromLooking.com. You can search via general terms such as sustainability as well as narrower terms such as local manufacturing. This description is one of many examples that has the capacity to create learning benefits for children. If you are a parent or grandparent of grade school children, you may enjoy reading more in the Learn from Looking book about ways to inspire children to take some time away from the ubiquitous screens that often dominate the hours of their days. Many communities have more local manufacturing than you might image, and taking children to see how things are made is a constructive use of time. I took my son to see our LED lighting production line, along with one of his friends and his father. Several years later my son was excited to see that our manufacturing was selected by the Discovery Network’s Science Channel show “How It’s Made.” The benefits of first hand observation into process and material transformation are a great potential catalyst to inspire curiosity and innovation for minds of any age.